We’ve spoken at length about the joys of having a functional outdoor living space for your home. For those who enjoy entertaining, a backyard that accommodates guests for a dinner party is nonnegotiable. Some backyards are ideal for hosting and toasting, but what features are mouthwatering must-haves for dining al fresco? Plenty of space, warm lighting, and a gorgeous view are all big assets for making a backyard a delicious destination. But the most important feature? A large table where guests can gather and enjoy each others’ company. To savor these fleeting days of summer, we rounded up eight luxury backyards tailor-made to entertain dinner guests. The following assortment of properties offer the crème de la crème of outdoor dining—all slightly out of our price range, but inspirational nonetheless. We promise you’ll eat them right up. Tasty tidbit: The Florida coast is full of luxe estates boasting beautiful backyards, but this one caught our eye because of the open outdoor kitchen and dining area, with a front-row seat for the sunsets. The massive 18,000-square-foot property is located on the decadent-sounding Hypoluxo Island. This private estate on Hypoluxo Island gives you front-row seats for the sunset. Tasty tidbit: This Napa Valley estate belongs to Pat Kuleto, one of the world’s most innovative restaurant designers. He’s had a hand in shaping more than 150 restaurants, so this backyard could possibly be the most ideal setting for hosting a dinner party. If this estate meets the standards of the designer and restaurateur Pat Kuleto, you know it’s going to be great for entertaining. Tasty tidbit: New York City and outdoor space don’t always go hand in hand, but this terrific terrace proves you can have it all. In total, the four-story penthouse in the heart of SoHo has 3,700 square feet of private exterior, along with skyline views that will (hopefully) justify that astronomical price tag. Tasty tidbit: This 10-acre desert estate—called Vista Rossa—boasts jaw-dropping views of the Red Rock mountains. Built right next to the Coconino National Forest, it would be perfect for hosting guests year-round, thanks to Arizona’s arid climate. Vista Rossa is cradled in the Red Rock mountains of Sedona. Tasty tidbit: This backyard is one of the most charming we spotted—thanks to the sheltering greenery and the twinkly string lights that form a whimsical canopy above the dining area. This home in the Hollywood hills is quite large, with a 7,000-square-foot interior and nearly half an acre of outdoor space. Props for the extra bench seating for less formal dinner affairs. Tasty tidbit: This rustic, French-style outdoor living space gives off vibes of Provence, but it’s actually part of a (relatively) modestly priced Louisiana home. The rest of the house is beautiful, but the spacious dining area is clearly the star of this home. A French Provençal-style garden lends itself well to owners who love to cook and entertain. 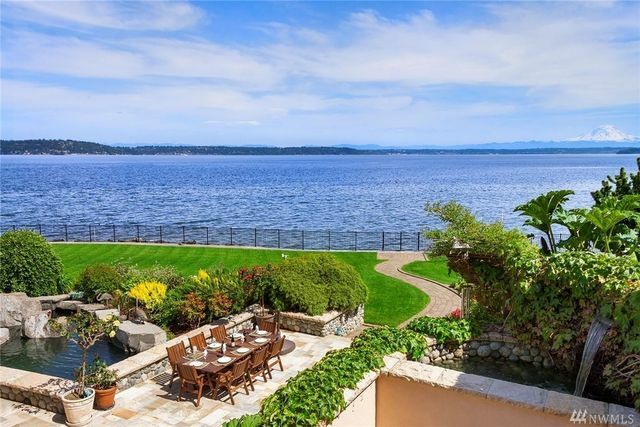 Tasty tidbit: Situated on the largest island in Puget Sound, this seaside chateau is just a short ferry ride away from Seattle. Judging by the home’s close proximity to the water and its breathtaking views, it was clearly designed with outdoor entertaining in mind. On Vashon Island, you can have a waterfront dining experience right in your own backyard. Tasty tidbit: Imagine enjoying a superlative meal—with world-class wine—right in the middle of a vineyard. 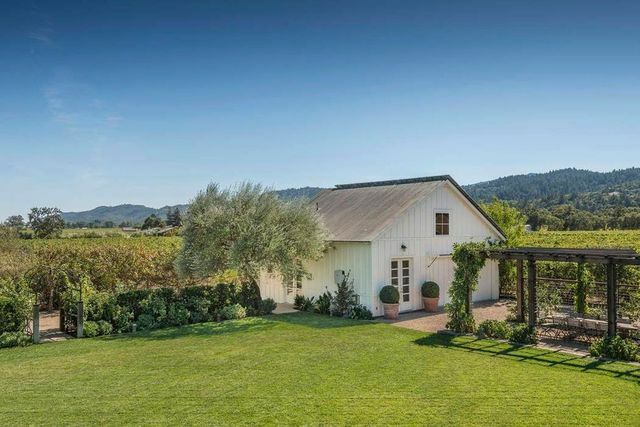 We wouldn’t expect anything less from a luxury home in Napa Valley! You can see the picturesque backyard dining area under the vine-covered pergola on the right in the photo below. Could there be anything more “Napa Valley” than enjoying a meal surrounded by vineyards?